Riding Gravel recently featured Raleigh's 2016 Gravel Line. The Roker, a new platform for 2016, will have internal routing, allowing for electronic cable capability, thru axles in the front and rear, hidden fender mounts, threaded bottom brackets, 27.2 mm seat posts for improved comfort, flared drop bars, and tubeless-ready wheels. 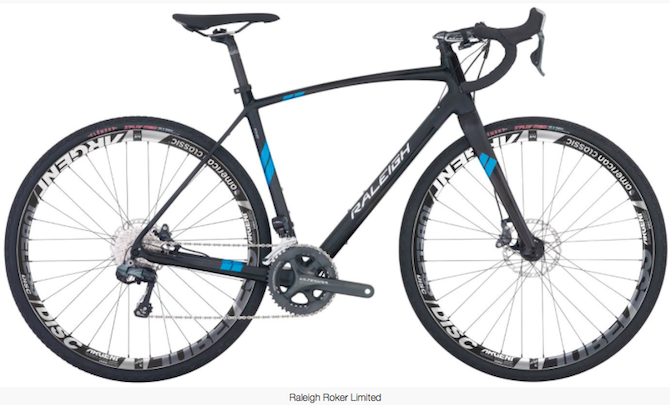 The steel-framed Tamland, Raleigh's first gravel rig, has minor improvements from the 2015 model including an integrated seat clamp, flared drop bars, and tubeless-ready wheels. The Willard, which is also being carried over from 2015, has significant upgrades from the previous model that will allow for a more comfortable ride and reduced fatigue on long rides thanks to the vibration damping stem and seat post. To compliment the "Anti-Shock" technology, Raleigh added tubeless-ready wheels and flared drop bars for the 2016 Willard models. Editor's Note: "...the most extensive "all road" line up available."